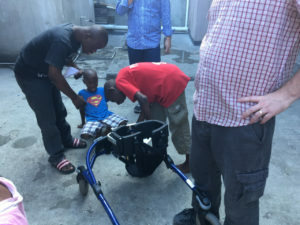 Through the process of finding a new home for Ryan’s walker, we were reminded of the beauty and the hope that can be found when we reach out and connect to each other. On our first evening in Haiti, Dwayne and our new friend, Nathan Freeland (from Joni & Friends California), had a fun time reassembling Ryan’s walker using about six different tools! 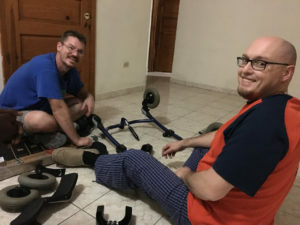 We were staying at Pastor Richard’s house who lives just outside Port au Prince. It didn’t take too long for the theme of this trip to become clear – it was all about meeting new people and making connections. Through our partnership with Joni and Friends, we were introduced to Greg Barshaw who was once on their board and now runs Connect2Ministries. Through Greg we had the opportunity to visit some of the places that his organization helps to fund, including one particular orphanage in Delmas 31. It’s been just over a week since we visited the orphanage in Delmas 31 and, I won’t lie, the memory of it still haunts me. We had just spent the better part of our day visiting various organizations that are involved in providing health care, education and nutrition programs in the area. We had met so many different people, had seen so many signs of vibrant life and yet had also seen so many reminders of the challenges that still exist because of the poverty and frequent natural disasters that occur in Haiti. Delmas 31 is a bustling area and the orphanage is situated in the middle of a busy street. No book or movie could ever have adequately prepared us for what we were about to experience. We came through a gate and then a narrow walkway into a courtyard where we smiled at the faces of children whose names we will never know. We heard all sorts of noises and smelled all sorts of smells. All the while, feeling fairly helpless about not being able to convey the value that we truly felt for these children. We were quickly surrounded by children and adults who were curious to find out why we were visiting them. After a bit of conversation with the staff, we were brought to a little boy named Samuel who was immediately lifted into Ryan’s walker. 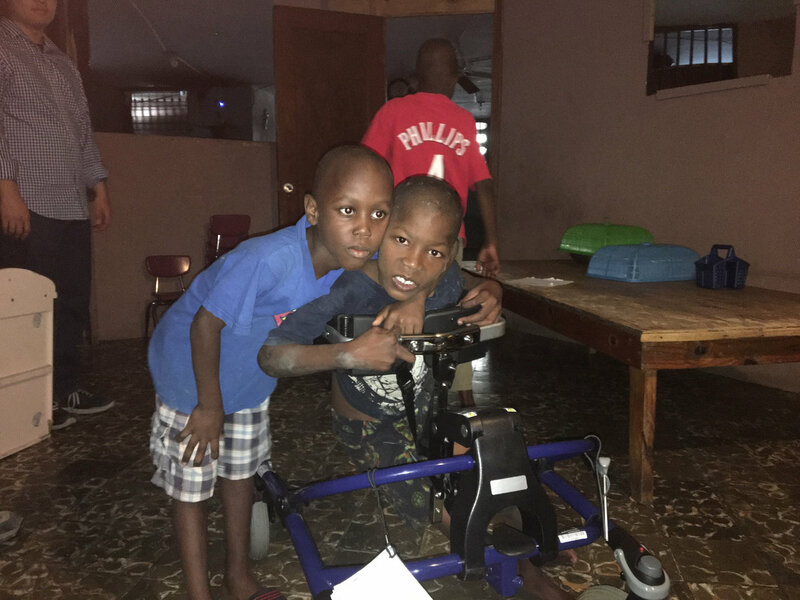 We weren’t sure if this would be the final or the only recipient of Ryan’s walker, but we were encouraged to know that there is likely no shortage of children who will make good use of it in the years to come. After we said goodbye to Samuel and his friends, I struggled to make sense of what I had seen and the jumble of emotions that I was feeling. 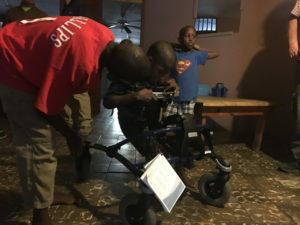 In the middle of a busy lively town, was a small simple home where a group of children with all sorts of disabilities lived. Children who would have otherwise been discarded or hospitalized or dead. Their home and their quality of life is so far from what we would ever want it to be for them. And yet in the middle of their very real suffering, I have to believe that their being in that home is the best life possible for them at this time. And that somehow, through all the brokenness and sadness, they are able to know love and hope through the relationships they share with each other. Though our visit with them was short, the gift of Ryan’s walker that we left with Samuel, will live on far longer. It symbolizes a new connection made. A tangible expression of love and encouragement across the distance.